No matter how dark things seem to get, WNW Member Tori McGoogan is always trying to balance it with some positivity. And as a full-time Art Director at Facebook, Tori is in a position to bring that positivity to the lives of a lot of people. It’s one she doesn’t take lightly. The challenge for Tori is to create work that is both engaging and also relatable to a massive audience. In our interview below, Tori discusses the challenges and rewards of being a full-time creative at Facebook, how creatives can combat imposter syndrome, and why finding creative energy in a wide range of disciplines informs her own craft. Tell us a bit about your creative background. Who is Tori and how did she get here? I have a modest diploma collection: I have an undergraduate degree in studio art, and a graduate degree in art direction. Before I became an art director, I worked in fine art, art education, illustration, and design. How would you describe your creative style? Do you recognize a signature style that links your projects? I don't think I have a signature style. I try to let the work inform how I treat each project visually. I consider the audience, the context, and how the end product will be used to help guide my process. What do you see as the turning point in your creative development and career so far? This is an easy one for me – grad school. After having worked for a few years as a designer and illustrator, I went to back to school to study art direction at the VCU Brandcenter. It's one of the single most impactful decisions I've ever made. What’s your creative mission at this stage? What do you feel is missing and what do you want to take up and deliver? My current creative mission is to add delight wherever I can. The world we live in feels like it just keeps getting darker and heavier. If I can add delight to the small corner that I have control over, I try to be satisfied with that. How have your past projects prepared you for your current role as an Art Director at Facebook, working on AR and camera art effects? Having a fine art, design, and art education background has equipped me with a keen eye for visual literacy: understanding how people interpret and engage the world around them. This is at the core of a lot of my work at Facebook; which means not only making sure all of my projects look good, but designing a product that people will find value in. How does your work at Facebook continue to challenge and excite you? For me, my challenge is the same as the reward: making something that helps the world express themselves and connect with others. How can you make something interesting enough, yet applicable enough for that many people? It's a tough question, but it's worth it. Which of your projects are you proudest of and why? For International Day of Peace, we set out to remind people of a simple message: that peace begins with love – a concept that seems more important every day with everything happening in our world. The experience we designed included a special in-product animation that activated when you chose to react to posts on that day with "love", and a custom animated film for the day. For Pride, we wanted to show up in the Facebook Camera with custom artwork to celebrate the moment. 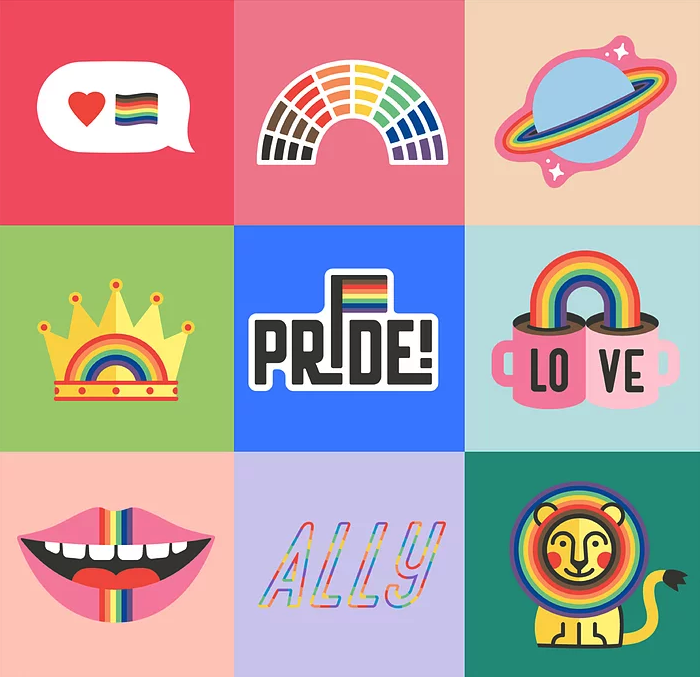 Since Facebook is all about building community, it was really important to me to partner with artists in from the LGBTQIA+ community to create really special and authentic FB Camera stickers and filters to help the world celebrate Pride. With everything happening to our environment right now, this project was close to my heart. The California Coastal Cleanup aims to educate folks about how we can help curb ocean pollution, and holds and annual beach cleanup event. One of the horrors of ocean pollution is that it's removing ocean life from our world. I took this point quite literally in the art direction and simply started removing sea life from photography. This direction creates a powerful moment when you see a family of whales now missing a mother whale. What would be your dream project or job, or is it already on your resume? In a dream life, I'd love to be a prop stylist for Wes Anderson films. I love his work and find so much joy in a good vintage find. I've always been into art, so fine art comes up in my references a lot. I love Matisse, Ellsworth Kelly, Diebenkorn. I visit art museums and galleries often; something I saw recently really that shook me was Ragnar Kjartansson's The Visitors (2012.) Instead of attempting to describe it, I'll just leave you with my overwhelming recommendation to go see it yourself. Other than art, I get a lot of energy from totally different disciplines like films, creative retail window displays, magazines, craft fairs, and poetry. Seeing creativity from totally different contexts helps me change up the thinking in my own work. What scares you most about making creativity your career? Creativity is such a soft skill, sometimes it can be easy to dismiss what we bring to the table. It can be tough working alongside folks with super concrete skills, like at my workplace – engineers. But then when they see what we do, you can see the same look of amazement on their faces. Not everyone can do what we do, that's why we're here. One book, one album, one movie, one show. Go. Movie: Always: Wes Anderson's The Darljeeling Limited. Recently: Moonlight. Show: Always: The Office (American version or bust.) Recently: Queer Eye! I love taking on personal art projects and learning new things. Recently I've taken pottery lessons and started weaving. I'm no good at either, but I enjoy just the practice of learning something new. It's a real source of joy for the art kid in me. I also love exploring my city, San Francisco. I've been here for a few years but still feel like there's so much to explore here and in the surrounding areas. One thing that surprised me about SF is that I never thought I'd fall for the local specialty – a $5 slice of toast. The toast is life-changing. But most of all, the happiest place in the world for me is curled up next to my husband, my cat, with a cup of coffee on a weekend. What’s something you’ve learned on your creative journey that other creatives should hear? I hear a lot of creatives in my world wrestle with imposter syndrome. I know there are already a bunch of talks and buzzy articles about this topic by very smart folks, and yet we still struggle. I certainly haven't cracked it myself – but what I do know is it's really important to take care of each other – champion one other, show up for them, lift each other up; and we have the same duty to take care of ourselves – self-care, therapy, downtime – find out whatever it is that you need and make sure you do that for yourself. Katie graduated from Brandcenter before my year, but she was someone we all sort of looked up to – and I think it's only natural, right? You would recognize her work immediately; she worked on the iconic MailChimp campaign which felt like every art director's dream (or am I just projecting?) I'm always envious of ADs who can make work that is both aesthetically super charming, yet also has some wit or a good sense of humor. She does this perfectly. Charles is the type of person that you want to work for as soon as you hear what they're about. Or, at least that's what struck me the first time I heard him give a talk. He has a great perspective on good work and how to do it, and is behind some of my personal favorite spots – like This Is SportsCenter and Shot On iPhone. With a breadth of work that beautifully spans silly to serious, it's hard not to look up to someone like that. Plus, he's a super nice guy. Parker's work is always so beautiful, yet super grounded in humanity, which I think is really important. If you get a chance, check out his piece “The Song” for Apple to see what I'm talking about. Plus, he's an absolute delight to work with! There's almost no shortage of talented folks in our industry, but being both talented and a truly kind person is the real treasure. Parker is that.